Launched earlier today, Intel’s new Coffee Lake CPUs are already making a bit of a splash. With six cores, 12 threads, high default frequencies, and the ability to overclock even higher, the flagship Core i7-8700K offers a wonderful balance of cores and speed, and rightfully earned itself our Exceptional award in our full review. It’s pricey, sure, but it isn’t excessively so – we have competition from AMD’s Ryzen processors to thank for that, no doubt. The red team is still able to offer more cores in the mainstream with the Ryzen 7 range, but they’re limited to about 4GHz right now; the ability to push Intel cores to around 5GHz can make a real difference, especially in games. Intel’s SI partners are already out the gate pushing Coffee Lake systems, and first through our doors was the Gaming Germanium from Overclockers UK. 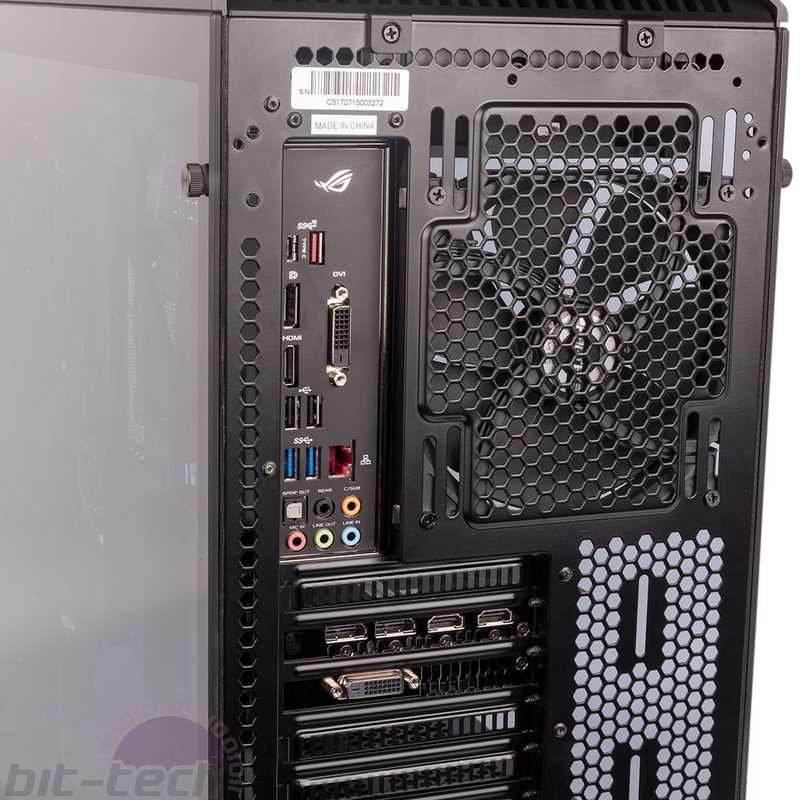 Now, £2,400 is definitely a lot for a system, but these days it’s not excessive when it comes to high-end gaming, and it’s still less than you might expect to spend in the high-end desktop space with Intel X299 and AMD X399. 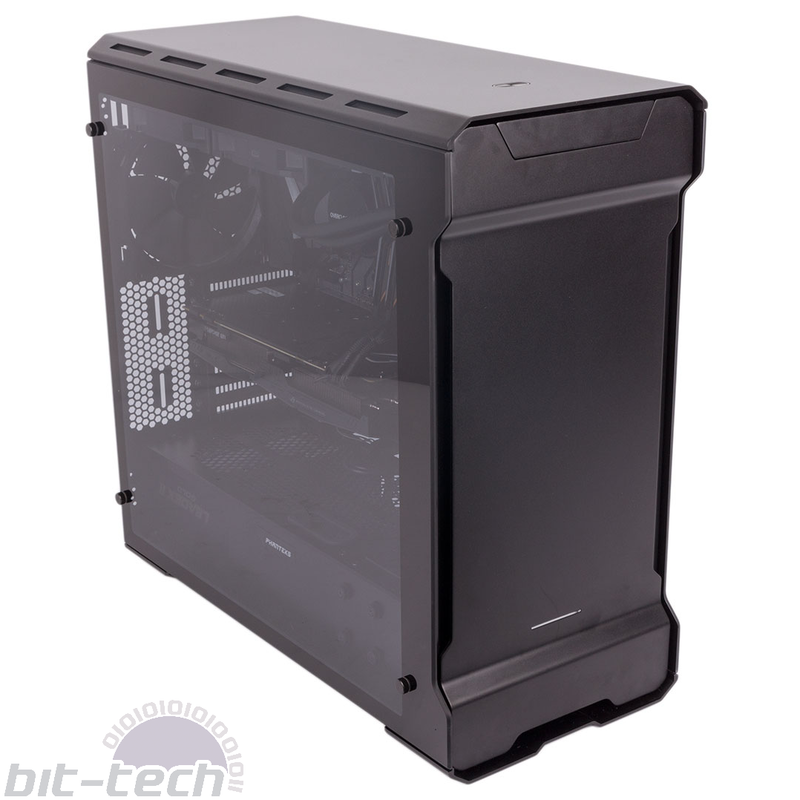 The OCUK system comes in the tempered glass version of the Phanteks Enthoo Evolv ATX, which is a lovely choice for a premium chassis. 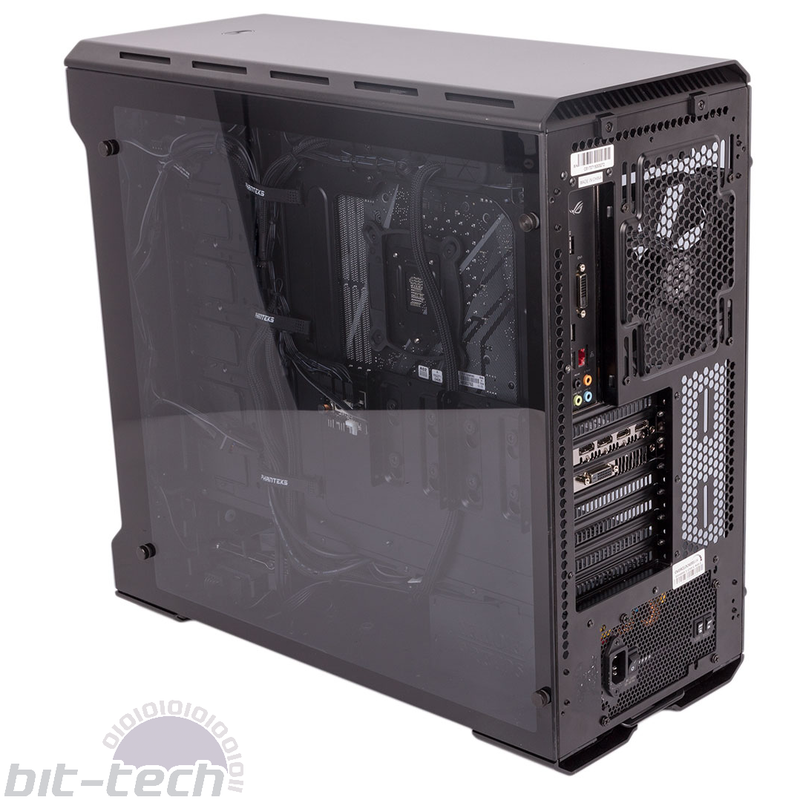 It looks great, is exceptionally well built, and shows off hardware nicely with its two tempered glass side panels. 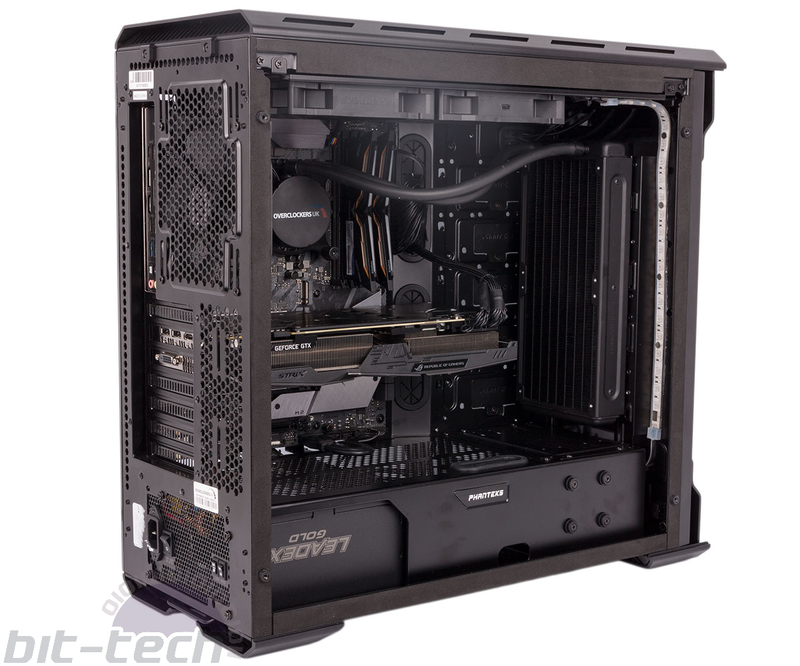 It is a little on the flash side, but you can easily opt to save some cash here, as Overclockers UK offers this system in an abundance of cases. You can’t turn your head in our labs these days without an RGB LED shining into your retina, and OCUK has embraced the current trend wholeheartedly. The Phanteks case has some RGB lighting of its own in the front panel strip and power button, but this has been expanded to include three extra RGB strips – two in the front panel running vertically down either side, and one helping to illuminate the main chamber. Via an RGB cable, control for the case lighting has also been given over to the motherboard to improve synchronisation across the components. 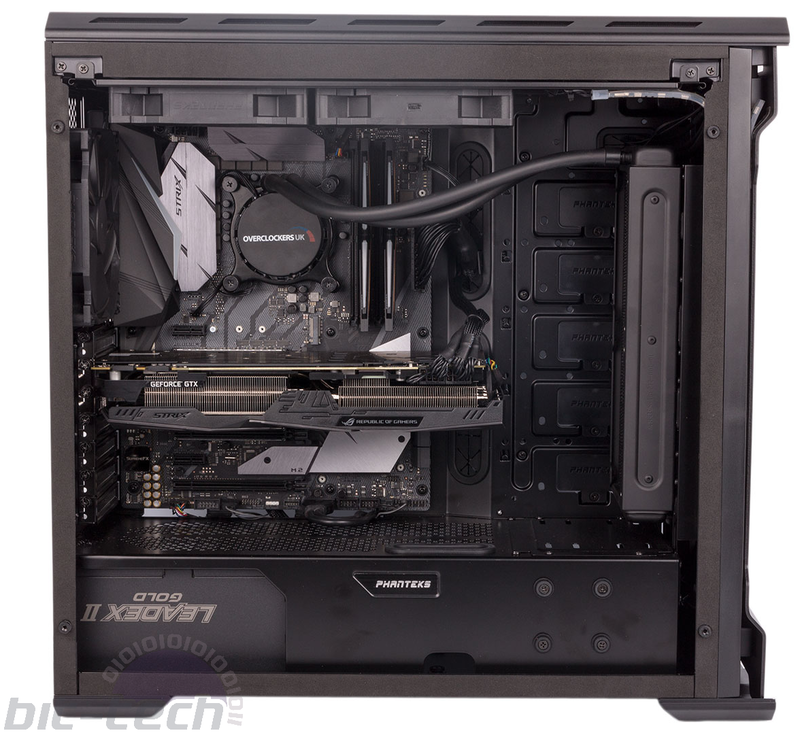 That motherboard is the Asus ROG Strix Z370F Gaming, and this cannot be changed in OCUK’s configurator. It’s too early to judge how popular specific motherboards will be, but this looks set to be a decent sub-£200 offering. It has USB 3.1 Gen 2 in the form of Type-A and Type-C rear ports (no internal header, though), dual M.2 ports, and RGB lighting that cuts aggressively across the I/O shield and VRM heatsink. The CPU is the aforementioned Core i7-8700K, which again cannot be changed, and Overclockers UK has boosted it to a healthy 4.8GHz across all cores. The company is already selling pre-binned chips at 5GHz (and higher! ), so if you’re desperate for a 5GHz sample, you can probably request that one is included (for a cost). The overclock is achieved here with load-line calibration at level 5, current capability at 140 percent, and a 1.35V vcore. That latter figure seems high, but we’ll reserve judgement until our stress testing. The team has also set a -5 multiplier for when AVX instructions are detected, which will reduce frequencies and thus temperatures – a smart move, if recent versions of Prime95 are anything to go by. The overclock profile was also saved to the motherboard, so you can easily revert to default settings if you go wrong when tweaking things yourself. The CPU is cooled by one of OCUK’s in-house Asetek closed-loop liquid-coolers, with the 240mm radiator mounted to the front of the case and cooled by two Noiseblocker 120mm PLPS fans mounted as intakes and controlled by the same CPU_Opt fan header thanks to a splitter and some extension cables. This was actually a small but silly mistake on OCUK’s part, as the system kept booting with a CPU fan error – if only the primary CPU fan header had been used! Thankfully, it’s an easy fix to change the header or ignore the monitoring, but a novice user would likely be at a loss and on the phone to tech support – not ideal. The all-in-one is complemented by three 140mm exhaust fans – one rear, two roof – and these are controlled by the case’s PWM fan hub. OCUK has also set the BIOS so that all fan headers (and thus the hub) are in Silent Mode, so noise will hopefully be well contained – a nice touch. A dual-channel, 16GB DDR4 memory kit from Team Group keeps the CPU fed and has RGB lighting of its own. It runs at an impressive 3,200MHz. We said this was a premium gaming system, and the Asus GTX 1080 Ti ROG Strix OC is testament to that. It’s a fantastic GPU in pretty much every regard and sure to deliver a great experience. It’s also the final part of the puzzle as far as RGB goes, and its support for Asus Aura Sync means it too will be synchronised with the rest of the system. If you don’t need a GPU this powerful, you can opt for a GTX 1080 or GTX 1070 instead. The Samsung 960 Evo 500GB is installed beneath the motherboard’s M.2 heatsink – another stellar choice, although some sensible alternatives are also offered by OCUK. The spare M.2 2280 port has no heatsink but is available for future expansion. Meanwhile, a single 3TB Seagate Barracuda drive is used for bulk storage, and again there are other choices if you want more or less. 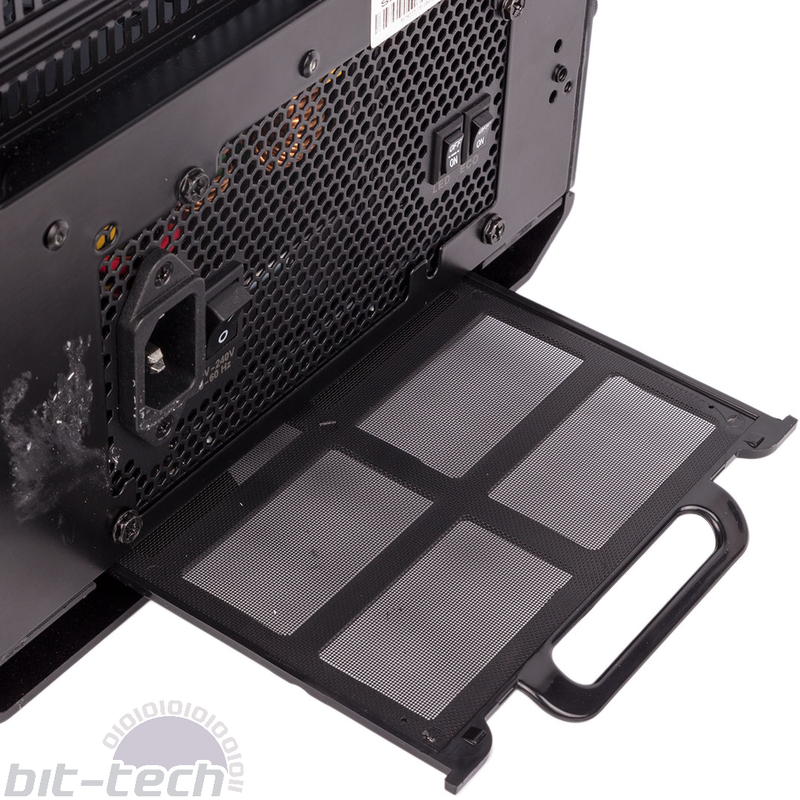 This leaves one HDD tray spare for future upgrades; the main area cannot be used to install Phanteks’ modular HDD trays because of the front-mounted cooler. An 80 Plus Gold rating and fully modular cabling on the Super Flower PSU means it gets the nod from us, and it has more than enough power for this system. 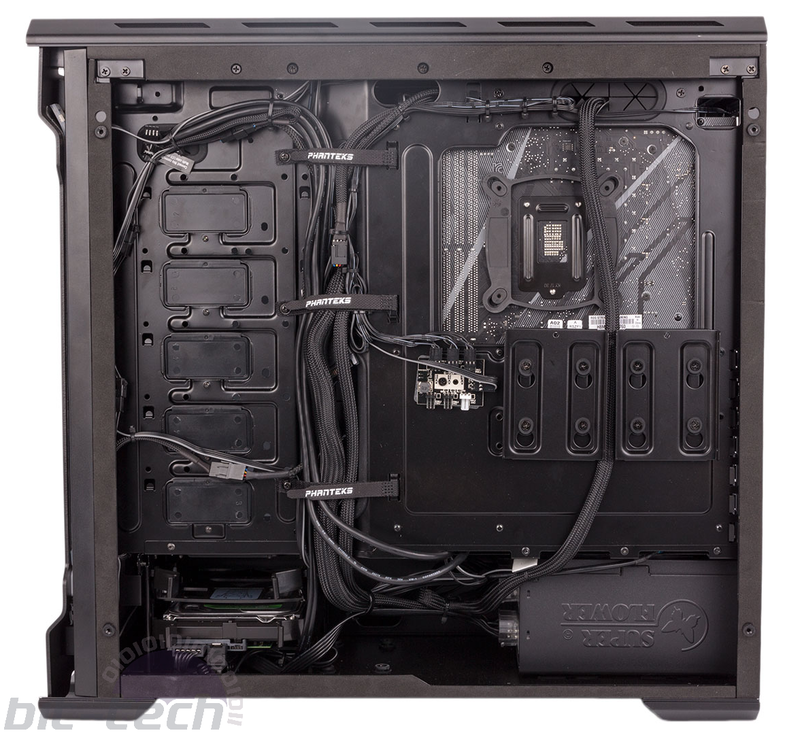 All cables here are black or sleeved in black, and all are routed neatly, which lends the system a professional feel. It’s also particularly important given that tempered glass is used on both side panels – there’s no hiding messy work here. We do think the GPU power cables should have been routed through the PSU cover, as there’s a specific hole for this, but otherwise we’re impressed. 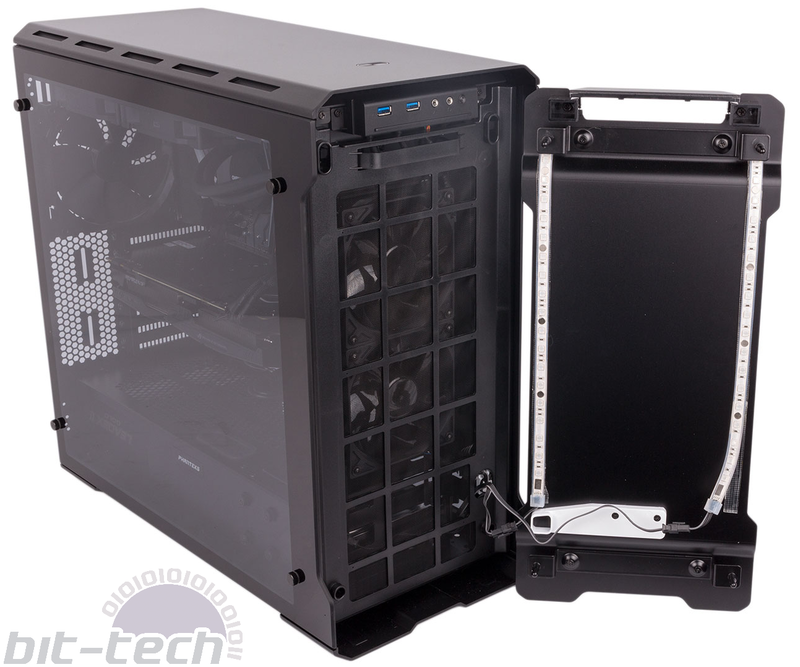 That said, we might consider choosing a case with a steel right side panel; neat though OCUK’s cabling job may be, we only really like seeing cables if they’ve been given copious attention and custom braiding. Booting into Windows, we were pleased to experience a clean desktop with no excess software bogging things down. The RGB lighting is synchronised to a colour cycle pattern by default, although some components seemed to lag behind others a little bit. The three-year warranty covers everything – parts, labour, and carriage – which is fantastic. You even get labour-free upgrades, so if you’re not confident upgrading the PC yourself, you just need to pay for the shipping and the part(s), and Overclockers will upgrade it for you at no added cost.